Step 1: So many choices! The best way to get started is with a complimentary 90-minute consultation. 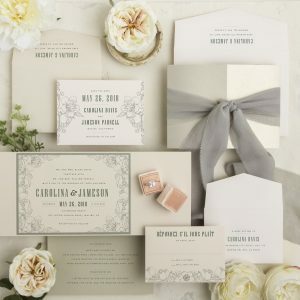 We’ll talk about colors, styles and themes you would like to incorporate into your paper suite, and view paper swatches, invitation samples and wording choices. 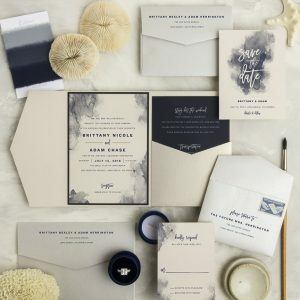 Once you decide to work with Persnickety for your wedding invitations, a non-refundable 50% deposit is required to order material and begin the design process. Step 3: My favorite part! Persnickety will design the first round of proofs and send them to you digitally via email for review. We will then work through additional revisions based on your feedback. 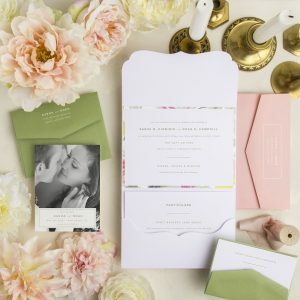 After the invitations are approved digitally, the customer has the option to request a final digitally printed proof before production begins. Step 4: Say “Yes!” to the design! Once written, final approval is received from the client, printing and production begins. A final count must be confirmed before printing begins. Step 5: Put a fork in them, they’re done! Custom invitations typically require 2-3 weeks of printing and production from proof approval. This timeframe may vary based on number of invitations, print processes used, and availability of materials. The final balance – including any additional charges for postage, assembly or addressing – must be paid in full before invitations are released. 1. Any concepts created throughout the design process, whether they are used in the final product or not, remain the intellectual property of Persnickety Invitation Studio and Persnickety Invitation Studio reserves the right to use such concepts in both digital and physical portfolios. Any and all personal information on the design (addresses, phone numbers, etc.) will be changed or obscured prior to publication in a digital portfolio. 2. If the client observes any nonconformance with the design plan prior to completion of the project, the designer must be promptly notified, allowing for necessary corrections. It is the client’s responsibility to proofread the designs carefully. Persnickety Invitation Studio can spell check but the client must make sure to triple check for typos and/or final changes. All design changes are final once sent to print. Persnickety Invitation Studio is not responsible for errors in proofreading, and will not incur the costs of reprinting orders. 3. All changes and additions, such as invitation count and design changes, must be made PRIOR TO final approval. This does not apply to programs, special arrangements, or any other last minute item. 5. The deposit is non-refundable, and will be applied to the total amount due for the wedding invitations and other paper goods. Balance is due prior to the release or shipping of invitations and other paper goods. 6. The client shall bear all costs, expenses, and the reasonable attorney’s fees in any action brought to recover payment under this contract or in which Persnickety Invitation Studio may become a party by reason of this contract. 1. A non-refundable deposit equal to 50% of the price is due at the time the order is placed. No design work or ordering of supplies will begin before a deposit is paid. 2. The remaining balance, including any additional charges that the customer may have incurred, is due at the time the invitations or other paper goods are completed and ready for pickup. In the event Persnickety Invitation Studio is mailing the invitations, the balance is due before the invitations will be mailed. 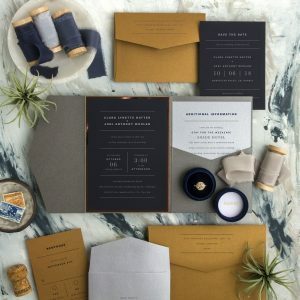 In the event Persnickety Invitation Studio is shipping the finished product to the customer, the balance will be due when the product is packaged and has been assigned a tracking number.